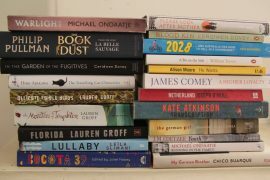 The short list for the Man Booker prize was announced today in London with two debut novels among the final six. The Lighthouse by Alison Moore and Narcopolis by Jeet Thayil join Bring Up The Bones by Hilary Mantel, Umbrella by Will Self, The Garden of Evening Mists by Tan Twan Eng and Swimming Home by Deborah Levy. Reviews of Lighthouse, The Garden of Evening Mists and Narcopolis have already been published earlier on this blog. The others will appear shortly.